This week I interview Kari-Leigh Marucchi about her WordPress journey and the WP photo project. WordPress 4.6 – -someone out here asked me when.. August.. Beta 1 june 29th! only a few weeks away. Adam: Why hello there everybody. This is Adam Silver, the host of The Kitchen Sink WP podcast. Thanks for being here. Let's get started. Upcoming events, we have Word Camp Ottawa. That is June 16th and 17th up in Canada. WordCamp actually, this one's an update here, postponement on Word Camp Winnipeg, sorry to say. I looked it up and I noticed that it was missing some information, a lot of it. Tickets were not available and speakers were still open. Anyway, I reached out and found out through the community that Winnipeg Word Camp has been postponed, new date to be announced shortly. Those are the two things. Also, this week, if you're in the Southern California area when you here this, I believe my meetup's this week, isn't it? Yeah. It is. Check that out. South Bay WordPress meetup. Check that out. Come on by. Love to have you. Not sure what we're doing for food this time. Last time we did soup and salad, chili. Time before that we did taco bar. We would pizza. It's been a long time since we've done pizza, but maybe not. We'll see. Moving right along, segment one, in the news. Short news week because I'm actually recording this a little early this week. I'm about to leave to travel for Word Camp. By the time you hear this I'm already back, but I'm on my way to Word Camp Northeast Ohio. Anyway, in the news, WordPress 4.6, some news here. Someone asked me last week about it in a seminar I did, and I just wanted to double check. It's on track. It's due in August. The first beta is due June 29th, which is only a few weeks away. It's kind of crazy. We just got 4.5.2, of course. 4.6 is due … Beta 1, June 29th. Release for that is middle of August if I'm not mistaken, the 16th. Let me double check that for you here real quick. August 16th is the target date for WordPress Version 4.6. I'll put a link in the show notes. You can follow along how that goes. If you want to help contribute, by all means you should. You can totally do stuff and help out, and translate and look at documentation and find bugs and kill bugs. Check that out. This week were going to have an interview. Before that, I wanted to a shout out to our sponsor starting right now. Having a website is a vital part of your business, but what happens when it goes offline, attacked by a hacker, or infected by malware? Well, don't worry. Conciergewp.com is here to help. We monitor all the vitals, perform all the updates, and make sure your website is secure and backed up, allowing you to focus on the business at hand. Use code relax15, that's R-E-L-A-X15, and save 15% for the first 3 months. Concierge WP, relax. We've got this. Adam: This week, segment 2, I have an interview with Kari-Leigh just recently. She is an awesome person, a good friend of mine, and I wanted to interview her because she's just a bundle of joy. She's amazing at what she does and what she's trying to do with the community of WordPress. We'll come back up to that with a tip and tool of the week, and we'll wrap things up. Here you go. 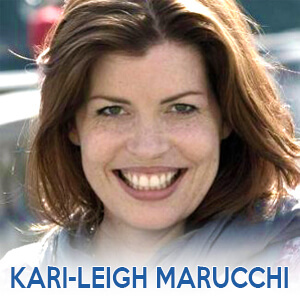 Today I'm joined by Kari-Leigh Marucchi. She has worn many hats over the years from a web content strategist, to help clients connect designers and developers in the agency world, and is currently happiest behind the camera, not to mention a character in front of it. A lover of WordPress, her family, and well just everything in general, including her dog. Welcome to the show Kari-Leigh. Kari-Leigh: Hi there. Thanks so much. Adam: Of course. Did I miss anything from that bio? Anything you want to add to that? Kari-Leigh: How long do we have? Kari-Leigh: I'm a certified paraprofessional, certified bartender, and certified massage therapist, and now I'm a photographer. Let's do it. Adam: Okay. For full transparency, which I'm always keen on, I like to tell people how we know each other. I was thinking back, I'm pretty sure we met the first in Word Camp Orange County either 2013, is that right? Adam: Okay. At the time you were working for who or what? Kari-Leigh: Velo Media, which became Crowd Favorite. Adam: That leads me to the first question. We just have a handful of questions for you, and I want my audience to get to know you. For those who don't know you, which is still very possible, how did you get here? How did you get involved using WordPress. As talking heads would say, “How did I get here?” Go ahead and answer that part. Kari-Leigh: Well, in 2009 I had got engaged to someone who had discovered WordPress very recently and was working with it after hours. As we decide to build a life together, we decided to build a business together and center it around the WordPress platform. We started Vela Media, and dropped the day jobs and went for it. I was able to bring in my project management experience from a career in the enterprise environment working with payroll and HR and finance departments, and implanting software to connect the departments between HR, benefits, payroll, et cetera. Kari-Leigh: I was able to bring that project management experience into what he does as well as what that specialty brought for me, which was back office skills. Between his technical knowledge and his history back several decades with the Internet and my background office and project management, we got it launched in a good direction. That's how I got started with WordPress. Adam: Right on. That said, I'm aware you're not a WordPress developer per say. Adam: You're not a pure designer, right? Adam: What are you right now? Kari-Leigh: Right now I'm a photographer, and I shoot Word Camps very happily. I'm what I like to call a master configurer with WordPress. It was my job to understand and often to document spec and client requirements, and figure out how we were going to budget developer's time to get the tasks done. In that, I became … Basically, it's my job to figure out what can WordPress do out of the box? What can plug-ins do to help us save developer hours? A lot of times there would be a situation where a developer may say, “Hey, yeah. I can handle that. It'll take 19 hours.” If it was possible, there are a lot of things where the response is, “Well, no. Let's not do that. I can do it in about 3 minutes,” if you really know deeply what the WordPress platform and your theme can do and the plug-ins available. That's fun. Adam: You're a photographer. No. Did you have any interest in switching out of project management into more development or into more bus-dev before you went to the photography? We'll get to the photography in a second. I want to get to that. That's very important to me because I used to be one as well. Did you ever consider growing more within the WordPress side of things of development itself? Kari-Leigh: I've always been fascinated with the code that I was working with people to build. I've had many people see that I can read it and I can troubleshoot. They've suggested I get into it, but I really believe in core competency focus. I am very good at project management. I'm very good at documentation, at spec development, and working with the client to translate their needs into what our developers can do. I really enjoy that, and if that's my core competency, spending time to train and code and hardware and management et cetera, it took away from what made me valuable. If I end up going back into project management, which I wouldn't mind, I love it. I miss the puzzle of it … It would be definitely going into project management again. I love developers. I've made a lifestyle over the last year of photographing them, and I'm love talking to them and listening to how they strategize and solve problems. I'm a developer fan girl. Kari-Leigh: There's a place for us. Adam: Absolutely. That then leads to the next question, which is, what are you doing now as photographer in relation to WordPress? Kari-Leigh: I have shot 15 Word Camps comprehensively, which means I will go to Word Camps and from start til stop I will be carrying my camera and seeking to document what makes each Word Camp special, what makes it unique, and what makes Word Camps something that keeps drawing the speakers and the sponsors and getting these volunteer organizers who blow my mind, bless you all, to do this and come to this again and again. I got the bug a long time ago in 2012. My first one was Word Camp San Francisco. When I needed to take a break from my professional administrative career a year and a half ago due to a family illness, I wanted to go to Word Camp Atlanta, but I wasn't ready to as a business person. I thought, “Now I can contribute and I'll bring my camera.” That was the beginning of history for me. Kari-Leigh: That's the evolution. I went from project management to, because of a family illness, deciding to bring my camera. I've fallen in love with being at a camp and providing images that help people promote the camp, the WordPress project, and themselves and what they do with the WordPress platform. Adam: Are you being funded for this? Are you making a living doing this, selling print? I'm curious. I kind of know the answer, but I want you to answer for those who don't. Kari-Leigh: I do not sell the pictures. I'm really glad you asked that, because that's really important for people to know that none of the images are available for sale. The project, the WP Photo Project as I call it, which is my efforts with Word Camps and providing these photos and collecting photos from other photographers, these are open source. They are creative commons license. We love credit if it's possible, but they are a gift to the community, to the speakers, the sponsors, the organizers, and the attendees. It's really not meant to put up for sale. They are a gift back to the community. Yes, it is important that I do bring in an income, and once I realized I really wanted to do this full-time … Not just travel to the Word Camps and shoot them … I love travel and I love shooting. I love my friends and my new friends. That's all really fun, but this is much bigger than that. Between the travel and the processing and the publishing of the pictures, I'm also developing a project to create a central repository for this photography. Hopefully futurlly known as WordPress.Photo. All of that time spent requires sponsorship. I spend also a lot of my time talking to potential sponsors and getting them involved in contributing to this community service that I'm doing and I'm drawing other people into to help make happen. Adam: Okay. The question is, you're being paid to cover expenses and cost and travel, correct? Adam: Okay. Has it helped in the sense of people reaching out to you outside of that. “Hey, we need a photographer for this other even that does pay.” Has that come to any fruition or is that an interest on your point at all? Kari-Leigh: It is of interest. I've done couple handfuls over the last year, including a very special one. A couple months ago I shot Adam Silver's son's Bar Mitzvah. Adam: Yes you did. Yes. Kari-Leigh: I'm very honored. They're available to see somewhere online soon I hope. Adam: We'll see about that. Kari-Leigh: We'll see about that. Adam: For the record, they are beautiful shots. We do like them. We just haven't released them to anyone yet or we haven't made a book yet because my wife works a non-profit. She was busy head down at this big project she had. I know you were afraid that, “My gosh, how come we haven't seen these photos yet anywhere?” It's because of that. My wife's picky about what she wants out for images of her. The photos are awesome. We had a different photographer for my daughter's a couple years ago, and like I said, your photos were awesome. Kari-Leigh: You're so diplomatic, but then kind. Thank you. Kari-Leigh: I really enjoyed that. My thing as an artist in photography is I love event photography. I've been open to other events besides Word Camps coming my way, but frankly, I'm never in town. Adam: Makes total sense. Current goal, current project is just the WordPress photo project, correct? Kari-Leigh: That's it. I have put all of my eggs into that one basket. Adam: A couple more questions, because I want to be respectful of your time. If someone came to you right now, and they said they really want to do something in the WordPress space, but they're not a developer, they're not a designer. They're not anything specific or, I hate to say the word, pigeonholed. What would you say to them? What would you tell them for advice? How do they get involved? Kari-Leigh: I would absolutely say volunteer at a Word Camp. Kari-Leigh: You get to know many more people that way than just walking in the door. Because you have a reason to speak to someone, to each person. You get pulled into conversations and activities where you end up bonding with people. That's natural. Absolutely, I've met more people being a volunteer than in any other way I stepped into the door as a Word Camp attendee. Once you do that, you become exposed to the various things that are needed, and you end up finding your niche. I can't recommend it more. Adam: I couldn't disagree with you at all on that. I couldn't agree with you more I guess is the right way to say that. I came into WordPress and the community based out of a volunteer. I think I went first as a guest of a sponsor, like I've told people on the show before. Then I volunteered as a photographer for 2 years at Word Camp LA. Then I was hired by our friend Chris Lema to shoot his talk. He needed some stuff for marketing purposes. That's when I met you, I think that same Word Camp. Kari-Leigh: That's when we met. Adam: The rest is history. It's been downhill ever since. Kari-Leigh: For me, that was, in my past, the bottom of hill that I'm at the top of right now. There were 2 people in particular who inspired me to do this, and that is you. When I saw you doing that, I knew … Because I had shot events before. I thought, “You know, I should really bring my camera. I'd love to that. I can see … I see the spirit here. My eye is framing. I know it's something that I can capture.” Of course time, when you've got a start-up, is at a premium, and I just wasn't able to, but along the way I also ran into Raquel Landefeld who also was bringing her camera. She didn't tend to take a lot of pictures, but she showed them to me. I saw she gets it. She senses the spirit of the WordPress community and she captures it. Between the two of you, that really was the seed. Adam: Yeah. Thanks. Thank you for that. I loved doing it. There was potential to do more of it, but I was looking … I saw the writing on the wall. From my perspective, the financial aspect of it. Not that I just wanted to make tons of money, but I have 3 children. I needed to make a living. So much of it is volunteer-driven of Word Camps and WordPress, Word Camp specifically. That said, I had to make a choice. “Do I keep shooting these, that's fine, or do I pursue more speaking and teaching and doing that route?” I made that choice. I still take my camera. I don't take it nearly as much as I used to, which upsets you. Kari-Leigh: Yes. I want you to contribute. Adam: It's better for my back. I have heavy glass. Sorry. Kari-Leigh: That was a humble brag right there. Kari-Leigh: ….to that point, this is not making me rich. Kari-Leigh: I have not been fully funded. I did all of 2015, the 7 2015 on my own dime. In 2016, almost all of them have been sponsored, but on average I've been sponsored about 60%. Now, even when I'm funded, when I get this sponsorship on rails and I'm funded 100%, this is a non-profit project. I'm definitely in constant contact with central making sure that my activities and how I administrate this is in line with the open source philosophy and in line with the efforts of Word Camp Central and the foundation and the copyrights of WordPress and Word Camp. This is a passion project that I would love to devote my full time effort to for the coming years, but it is non-profit. This is not going to make anybody wealthy except in spirit. When I see how people react to my work, as I have just once again in Word Camp Ashville, when they see someone care to take a photograph of them that they can use as a business headshot, when I hear many, many times … I can't even count, infinite number of times I've heard, “I've never had a quality shot taken of me. Now I have something I can use.” It just hits me in the feels. I am very willing to … getting a little misty here. I am very willing to dedicate my professional self and personal self to this. I'd just like to say why. Why do I care about the WordPress project so much? I'll tell you, it's specifically because anyone who has a brain, Internet, a computer, and electricity, can pick themselves up from the gutter and completely change their lives, and take charge and create a business where they can self-actualize and create income. That is one of the most powerful devices I've ever come across in my entire life. That's why I do it. Adam: Yeah. Okay. Last two questions here. 3 software tools that you can't live without? In your case, obviously they very well may be photo-based, but what are the 3 tools that you live and love on a daily basis? Kari-Leigh: I am in Lightroom more than any other thing by far. It's with Lightroom that I'm able to … I use Lightroom to adjust the meta of the photo files. I'm going to point that out because part of what makes what I do so time consuming and so special is that every photo file is titled and meta'ed to indicate the speaker, the camp, the details of it, what they're talking about, perhaps their company. These are the things that make these photos findable in the future. If we're just taking photos off our cell phones and tweeting them, maybe throwing them on Facebook, they're great in the moment and then they're gone. Lightroom is what enables me to create historical documents out of these photo files. Then of course Photoshop. I'm getting to the point … I used to use it a ton more, but I'm getting to the point I really only use it if I'm going to do photo stitching or if I'm painting. I do on a portrait, I do do some retouching if someone's got some unusual things going on, but if they're glowing with Word Camp happiness, there's really not much photo editing that needs to be done. Then of course Gmail. That's my lifeline to the outside world. Adam: Not one of those has ever been mentioned. I guess Gmail might have been mentioned in the past, but most people … I talk to developers and other designers or different non-photographers per say. Adam: Lightroom, Photoshop, and Gmail? Adam: Last question, and I want to thank you for your time, where can people best follow you, reach out to you, stay in touch with you if they wanted to find you on the ethers? Kari-Leigh: All announcements come out through Twitter on @foundartphotog F-O-U-N-D-A-R-T-P-H-O-T-O-G.
Adam: Thank you so much. I appreciate you being here. I hope to see you soon at the next Word Camp. Where are you going to be next? Kari-Leigh: There's a little room where I may be able to OC after all, but right now I am working on finishing fund raising for Vienna. It's in two weeks, so it's really tight. This is an essential one to be at, both for the largest Word Camp we've ever had, and for the WP Photo Project, what both participating in that can bring to the project and to that camp. I'm also slated to work on contributing day on developing concepts around what are the specs for a possible WordPress.Photo in the future, which may be that central repository for all the photography of the Word Camp culture dating back since it began and from all around the world. That's real exciting. I need to be there. Kari-Leigh: In terms of my next cinched one, it looks like New York City. Adam: Okay. I will not be at New York, I'm sorry to say. Adam: The next one I will be at when this podcast gets released, I will be at … I think OC will be the next one for me as well, Orange County in Southern California. Kari-Leigh: I'll cross my fingers to see you there. Adam: Okay. Thanks again for coming on the show. Really do appreciate it. We'll talk to you next time. Kari-Leigh: Thank you so much, Adam. Adam: All right. That was an awesome conversation I had with Kari-Leigh. Really do love her. She is one of my favorite people. Seriously is. If you can help out, if you want to sponsor her for what she's trying to do with the photography project, by all means you should totally reach out and help her. It's all about community. It's the foundation. It's open source, et cetera. We want to just have a historical documents here. Thanks again to Kari-Leigh for being a part of the show. Moving on. Segment 3 tip until the week, this one's a little bit older … Not that old, from October 12th of last year. The post was: Settings for iTheme Security Pro. I use this a lot for some of my clients, actually, most of my clients, and my own sites. They had done a blog post on their website over at iThemes. I'm going to link to it in the show notes. It just takes you through the best settings to help you secure you're site if you're doing it on your own, if you're not using a 3rd party service like Concierge WP. I'll link to it in the show notes. It's over at ithemes.com. It is from October of last year, but it's very relevant. The settings are still good. There's a video, helps you walk through some things. Check that out. That is it this week. If you have any questions, go ahead and send it via email, adam@kitchensinkwp.com, or use the Speak Pipe functionality of the website. Thanks for listening. See you next week. Go out and do some awesome things with WordPress. Talk to you later. Bye-bye.